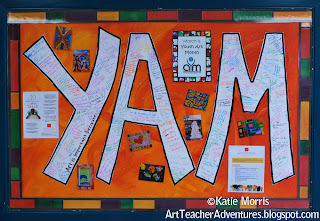 For the YAM bulletin board at my 4th-6th grade school, I cut out giant letters (from 24x36 inch paper), painted a black border for definition, then invited the students to use multicolored markers to write a sentence about why they think Art is important. 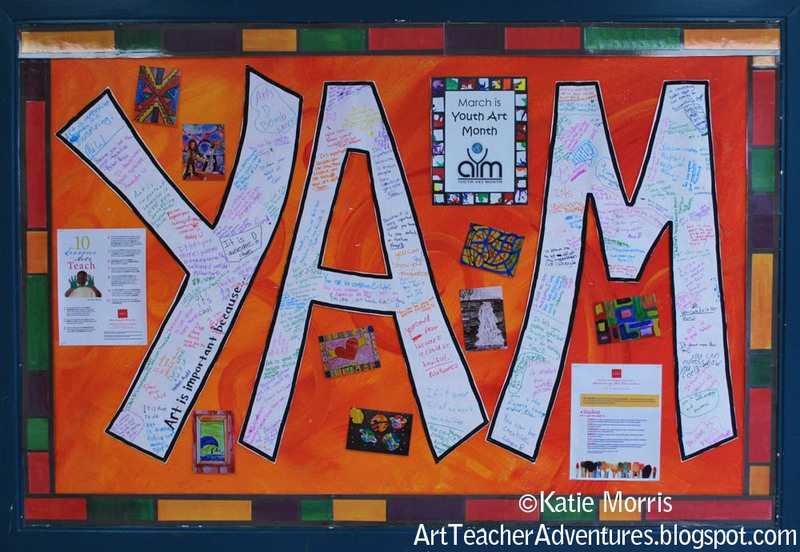 I filled in the negative space with some photos of student work, a "March is Youth Art Month" sign, and a couple advocacy signs from NAEA. This bulletin board is best appreciated when you take the time to read what the students wrote. Most were really excited and thought about what they wanted to write. I did find a few silly comments like "chicks dig art"and "everyday I'm shufflin'"but nothing inappropriate, which is always relief! Check out the photos below to see some of the students' thoughts. Apparently I use the words "texture" and "details" a lot.